You can find French influences throughout the Louisiana culture. It’s loudly presented in the architecture, and you can enjoy delicious cuisines bursting Creole or Cajun flavors. Cajuns, who are descendant of people who migrated to Louisiana from Canada in the 1700s (Acadians), contribute to a major portion of Louisiana’s population and its culture. Today’s Creoles are descendants from the original Louisiana settlers who also influence the culture. They are of French, Spanish, African and Native American descent all mixed together in a wonderful mosaic. They even have their own language, though fewer people speak it as the generations get older. The city of New Orleans is known for many things. The first thing that may come to mind is the Mardi Gras celebrations that take place annually around Fat Tuesday in February. Then there are the Super Bowl champions, the New Orleans Saints, and their record setting quarterback, Drew Brees. Another major thing that New Orleans is known for is its musical sound. Jazz has its roots in this town. Musicians like Louis Armstrong, the Ragtime bands of the early 20th Century and the tunes of Pete Fountains are among many that have contributed to the vibrant jazz of New Orleans. 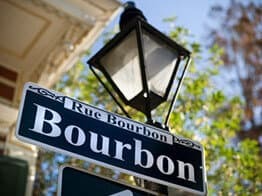 The French Quarter is the oldest neighborhood found in New Orleans. The Spanish left their mark there as well. The Louisiana auto transport industry has a tough go of it shipping to New Orleans because it is the end of the distribution line heading south on interstates I-55 and I-59. Making matters worse is that I-49 ends in Lafayette and doesn’t make it to The Big Easy. Shreveport benefits from I-20 in the northern part of Louisiana, but there is little else up there. Thank heavens I-10 travels east-west nearby New Orleans or the city would really be out of luck. We know New Orleans is a big town, but people are often frustrated with how difficult it is to ship to or from there. If you are shipping a car to New Orleans, the auto carrier will be on land that is 6-20 ft. below sea level. Oh my! When the weather is nice, which it usually is, then there isn’t a better place to be than on the bayou near the Gulf of Mexico. But my oh my when those Hurricanes blow in, like Katrina in 2005, it can be absolutely devastating. We remember people frantically wanting to ship their vehicle out of The Big Easy leading up to Katrina, but guess what, the Louisiana auto transport drivers had already hightailed it out of there. Who wants ten cars on his trailer staring at a hurricane? For more information regarding how the vehicle shipping process works, feel free to call our toll free number at 800-600-3750. You may also feel free to talk to a Louisiana auto transport customer service associate about how you can have your car shipped. You can also visit Direct Express Auto Transport to fill out a simple form and get a free car shipping quote. We make it easy to book your vehicle shipment online. Direct Express Auto Transport makes booking your vehicle shipment a simple process online.